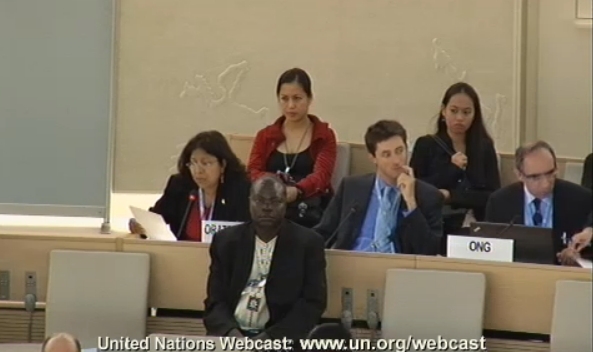 MARUAH Singapore has made an oral statement at the United Nations, as the report on Singapore’s human rights was adopted under the Universal Periodic Review (UPR) process at the 18th session of the Human Rights Council. Ms Braema Mathi, President of MARUAH, made the first Non-Governmental Organisation (NGO) oral statement under the banner of ARTICLE 19, an international NGO focusing on freedom of expression and information. In the oral statement, MARUAH highlighted that the 2 recent elections in Singapore have shown that the people want to be engaged; the government too has said that. Hence, it is disheartening that they have not supported the core recommendations on civil and political rights. MARUAH urged the Singapore government to focus on civil and political rights as a priority over the next 4-year cycle of the UPR process. The following countries and organisations made oral statements during the session. The full text of MARUAH’s oral statement can be found in the attached PDF. The video recording of MARUAH’s oral statement can be found at the link below. This entry was posted on Friday, September 23rd, 2011 at 11:05 am and is filed under Position statements (Maruah), Universal Periodic Review (UPR). You can follow any responses to this entry through the RSS 2.0 feed. You can leave a response, or trackback from your own site.